"The softly, softly approach has turned out to be a disaster, fuelling ever greater chaos in the classroom. Last year 17,000 primary school pupils had to be suspended for attacks on teachers or other children. According to recent surveys, a quarter of all teachers have faced physical violence from pupils." The case of former Deputy Headteacher Roy Cope has for some time been featured in much of the national media. After undergoing a trial and awaiting a disciplinary hearing for allegedly assaulting a pupil (for which he was aquitted by magistrates), he was reported to have resigned from his job. Leo McKinstry in the Express this morning used the news to argue that the "softly, softly" approach to school discipline was an abject failure, citing the thousands of primary school pupils excluded last year and school staff surveys showing a quarter of teachers have faced violence from pupils. So are teachers under attack? How many pupils are excluded for violence? Exclusion statistics are one way of giving us an overview of the types of violence in schools today. On this front, the figures from the Express aren't difficult to find. 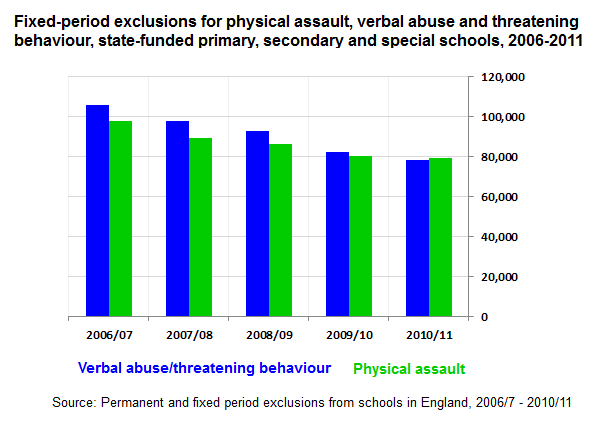 In 2010/11, there were 16,990 'fixed period' (as opposed to permanent) exclusions for physical violence from state-funded primary schools in England. However these won't all be separate pupils, as some children will be excluded more than once in the same year. It's nevertheless a considerable number, and given the 190 required days in each academic year, this has given rise to headlines that 90 pupils are excuded every day for violence in English schools. Another drawback is that exclusion statistics only tell us how many incidents of violence resulted in an exclusion, and tell us very little about how many violent incidents are actually taking place in English schools. To cite it as proof that a 'softly, softly' approach is failing is therefore problematic: if schools were cracking down on ill discipline and excluding more violent pupils, we might expect this number to rise, rather than fall, at least in the short term. It's difficult to answer this comprehensively. The School Census - which provides us with the data for exclusions and the reasons for them - has only been collecteing such data since 2005/06. Before then, the Termly Exclusions Survey gave us less specific figures dating back to 2003/04. What about violence against teachers? "No direct evidence is available about the number of assaults by pupils on teachers. However, reports of violence against teachers feature in some surveys by teaching unions, although they are far more likely to report pupil-on-pupil violence." So can we draw on other research to give us an idea? Leo McKinstry gives us a hint, pointing out that "surveys" suggest that one in four teachers "have faced physical violence from pupils". This figure comes from a survey undertaken by the Association of Teachers and Lecturers (ATL) in 2010. Asking over 1,000 primary, secondary and further education staff (not just teachers, bear in mind) about their experiences of violence, 25.9% of those dealing with physical aggression said it had been directed towards them. Clearly this isn't a quarter of all teachers. But the ATL have also done a more recent survey for 2012. Asking over 700 educational staff whether they've had to deal with a violent pupil in their school or college in the academic year, 33.1% responded affirmatively. Of these, 28.3% said violence had been directed towards them. So it's not correct to say that of all staff one quarter experience violence directed at them. The most recent evidence shows that it is one quarter of staff who experience violence. Taking the most recent survey findings for 2012, this actually adds up at 9% of all educational staff having experienced violence directed at them. While statistics in the area are limited, the available evidence reflects badly on the claims made in the Daily Express this morning. 17,000 fixed-period exclusions did happen in 2010/11 - but this isn't the same as saying that 17,000 different pupils had faced exclusions. What's more, recent trends show exclusions for violence are falling, not rising. The claims don't bear up any better when considering violence against teachers. It's not the case that a quarter of all teachers have faced physical violence from pupils. Instead, a quarter of educational staff who have dealt with violence have faced violence against themselves, but on the latest evidence that only amounts to 9% of all staff. Are more teachers quitting the profession than entering it? Is a relentless workload forcing teachers to leave for lower paid jobs? Are 90 pupils a day suspended from primary school for violence? Are there more than 4,250 schools in Britain without a male teacher?